Each morning Uganda gets a true awakening with the breakfast show voice of the airwaves, Brian Mulondo, a renowned social media influencer,TV and radio presenter, news anchor and emcee. His media entrepreneur experience spanning close to fifteen years all initiated around 2003, with a lifestyle NTV television show “Better Living”. He was then selected for a show called Tricksters,that revealed how people were hoodwinked from property and money. He made a household name and became the Uganda brand ambassador for MTN for the World Cup 2010. He currently is also live spreading out lucky numbers each Sunday closing the weekend with Supa 3, the NTV lottery show. My desire to see a change in the world makes me wake up every day. When I die, I don’t want to just be remembered as someone who was in the media but as someone who left an indelible print on media through inspiring young people. What is your true passion in  life? My first shot at TV opened my eyes. I hosted a show called Better Living for free and when I was called by the Producer to get some “facilitation”, it was too huge to be called that. Soon I realized that I could earn a lot while having fun. Years later, when I looked at TV shows, I realized that most shows were poorly done. So I created The Timeline Show and in just 1.5years has brought some considerable income. What kept you going when you thought about giving  up? about me. My life is not just about me but several people. doubted, as long as you are breathing, you can start all over again and make the best come back. Joan Nalubega encountered the plight of malaria in Africa one too many times during her childhood years at an orphange in Uganda. She resented the female Anopheles mosquito for spreading mortality and poverty by hampering socio-economic development. She was determined to war this life threatening battle against bloodsucking mosquitos spreading malaria, which seemed to be as common as the flu epidemic. This all came into effect with the invention of an anti-malaria soap that eventually attained scientific proof all the way from the Mannheim University of Germany of its active organic ingredients that repel mosquitoes. Malaria, a mortality contributor accounts for over twenty percent hospital deaths She embarked on training in social entrepreneurship and set off to create a venture to tackle malaria, an ongoing battle in Africa. She formed a company Uganics that specializes in products to combat malaria. An anti-malaria soap repellant soap lasts for six hours after a bath. Even laundry washed with this soap has the very same effect. According to malaria reports , children below the age of five are most affected with malaria. Ninety percent of recorded child deaths are due to malaria as rural communities have a lack of mosquito nets that are treated and other preventative measures. There are continuous efforts by governments to invest efforts in the distribution of mosquito nets and DDT sprays. Malaria, however, remains a factor as these solutions are not long lasting and mosquito nets only function during bedtime. DDT raises other health concerns due to chemical compounds. The government of Uganda has issued a Medical Certification of Uganics soap. The soap solution is an affordable, organic long-lasting mosquito repellant that even helps mothers in rural families with babies. One of my great visions is to see Africa a better place for us and for the next generation. I believe it’s our generation to mManage&More ake this difference, I am passionate about the well-being of an overlooked population with fewer opportunities to make their lives healthy, mostly because of their financial capacity. I believe everyone can have the best life at how much income they can afford. I was taken to an orphanage in 2003 at Kankobe children’s home with my sister after my mother got really ill, I faced a lot of challenges as a child with no parents around but mostly I was often sick from malaria, this made me miss school a lot, miss playing with other kids and made me as well a victim of discrimination and unhealthy as a kid. But as a child, I always asked myself why I kept on being sick over and over again, so I developed an interest to learn more about malaria, I told myself when I was 11 years that I will stop this disease before I even had any knowledge or access to internet to search about the disease. The more I have grown, I have been hearing people having different perspectives of Africa as a continent and its very sad to hear what they think, I want to change that, not by talking about the good things we have but by solving challenges that make us look bad and scary. My passion being saving and finding solutions to problems I have faced is much stronger than my need for money and what drives me for Uganics is the need for an affordable, effective and easily usable solution to the big problem of malaria, that would have been easy for me to use then when I suffered its consequences. Depends, I got paid first for solving a challenge when I was 8, I collected tires with my classmates and made sandals for my fellow students who they did not have shoes for school. For Uganics I started getting paid in 2017 when I sold my first products. Am very persistent person, I don’t let challenges challenge me and to be specific for Fighting malaria, it’s a purpose since I was a child so every time I get information on malaria cases in hospitals I work with, it makes me feel more responsible to fight the disease. My hunger to see change, to see how a world without malaria would look like. The people who have doubted me, have made me who I am today, what I do is I overcome challenges and every time I do that, it’s a success. I do not blame them because we are different people and we do things differently and if anyone want to make it in life they have to believe in themselves because no one believes a person without hope. My advice to anyone who look up to me is, if you are passionate about something and you feel like using your passion to achieve something or as your carrier, go for it, because something you’re really passionate about will never make you tired, it’s something you will do anything for instead of giving up. “Don’t let money be your drive” And if you want to start, start now, if you need someone to believe in you and support you, your right there to do that for yourself then us we will follow, that’s what we human beings do. Bright stars never stop shining in #CreatepreneurAfrica, Flavia Tumusiime's world. All the way from Kampala in Uganda, renowned television and radio presenter, actress, emcee and speaker,Flavia's career in Africa's fledgling media world sparked off at the early age of fourteen.She seeded her career when she was selected to host a popular teen television show, WBS TV's teen's club . With a drive to make a difference,she stayed in the limelight and was featured in CNN African Voices as one of three growing African female brands of 2017. She continued to host the WBS TV teen show for the coming four years and later presented K files, a WBS TV program. Since then she presented the Guinness Football challenge in 2011, aired in Kenya and Uganda. The Big Brother Africa 2012 presenter, joined NTV Uganda as a news anchor and currently co-hosts a morning show, Morning@NTV. Her radio career initiated as a presenter in HOT100 Fm she is currently stationed at Capital FM. She is currently represented by the renowned Waka Agency, Africa’s first Pan African Talent agency headed by the acclaimed Rosie Motene from South Africa. The thought of what kind of legacy I can leave for the next generation of empowered and successful women. Honestly I’m a communicator at heart and I find that my passion is communicating, whether its radio or TV. I was 14years old when I was encouraged by my family to try audition for a teens TV show and I got the job on first try. I really felt like I was a natural and over time I realized I had a passion for it. People fascinate me the most. The way they react and are emotional about all I do and say. It’s scary and exciting knowing how much impact I can have. When I was transitioning from radio to TV, my then program director encouraged me to try and realize I can commercialize my talent and up until then, money was secondary to my passion and maybe still is but at least now I know and understand the commercial end of things. I get a lot of moments that make my work hard or tough days. The most uplifting thing is learning to find your own reason and joy for doing your job. I have found my own happy in my passion and that keeps me going. Haahaa well the success speaks for itself, all the response I need. To know it’s a day at a time, you won’t work on your goals unless you break them down a day at a time. Uganda, the amazing tapestry of wildlife, landscape and welcoming locals. The rivers, lakes, majestic mountains, wildlife and national park summon out a soul welcoming call to international travellers. The tallest snowcapped mountain range in Africa, the Rwenzoris. For those on a venture to explore tropical climates, Uganda has some of the best offerings. Some of the many breathtaking destinations include the Ajain Game reserve, Mgahina Gorilla National Park. Bwindi Impenetrable National Park. Kidepo Valley National Park. The Queen Elizabeth National Park, The Murchison Falls national Park m Kibale Forest National Park, Rwenzori National Park and the Ssese Islands . The National Museum is one interesting venture, one of the core links to Africa, our motherland. The twenty million old fossils unearthed in east Uganda can be found here. The abundant wildlife includes rare birds and chimpanzees. 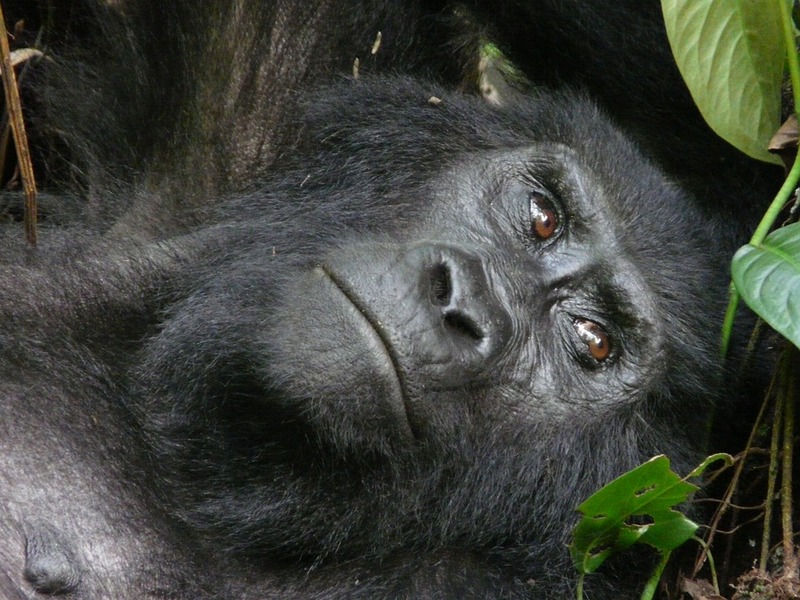 The Bwindi National Park is a renowned sanctuary for mountain gorillas. Murchison Falls National Park northwest is famous for its tall 43m waterfall and wildlife too. The Adrenaline adventure of rafting the Nile is an unforgettable experience with mountain gorilla tracking in the misty habitat. Diverse and resplendent nature and you get a chance to experience the big 5! The diversity of trees found in the wetlands, open water systems, moist tropical forests, woodlands and drylands, bushland, thicket, grassland and semi-arid regions of Uganda is a must for tree lovers. The rule in Uganda is if one tree is cut down, three more need to be planted. It is green all through the year! Uganda is a safe destination .If there is an odd hippo that appears at the campsite do not rush!. It is good value with minimal visitors in comparison to other destinations in East Africa. Get your visa at an embassy or on arrival ar Entebbe international airport. The visas are valid for 3 months.